Christians are constantly attempting to defy the words of Jesus and predict the time when he will return and the prophetic apocalyptic war will begin. Many Bible students have poured over scripture, coming up with theories based on their interpretation of the words. And many a minister has sadly led his “flock” into selling all of their possessions and camping out on a lonely hill, expecting to meet their “savior” on the big day. Ironically, according to the Gospels, Jesus told his disciples that they would still be around when he made his return. But once dead, he appears to have have stayed dead. We have the stories of his rising up, handing around for a while and then physically ascending into the sky. That was one of those many magical moments in the Bible that scholars have a hard time believing really happened. A lot of other “prophets” since Jesus gave their followers the same promise. We think of King Benjamin Purnell of the House of David in Benton Harbor, Michigan, whose dried corpse may still be lying in a glass coffin on the old House of David properties. He promised to come back. His bearded disciples hung around until they died off. The place is in ruins today. We could not find a record of what happened to the body. If the county dealt with its disposal, King Ben's body may have ended up in a pauper's grave. 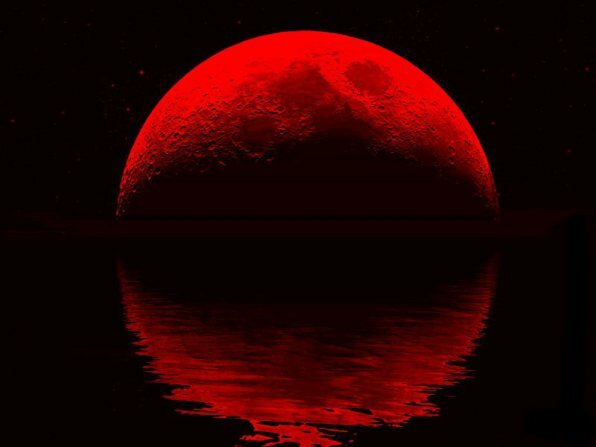 The latest end-times prophecy has been uttered by Christian ministers John Hagee and Mark Biltz, who are telling followers that a series of four consecutive lunar eclipses (blood moons when a full moon turns red in the night sky) coinciding on Jewish holidays, and with six full moons in between, is marked in Acts 2:20 and Revelation 6:12 as a sign for believers to look up. Such an occurrence, known as a tetrad, ended with a lunar eclipse on September 27-28, 2015. The first one happened on April 14, 2014. The next was October 8, 2014. Then one on September 27, 2015. The red color is caused by Rayleigh scattering of sunlight through the Earth’s atmosphere before it lights up the Moon. Well, yup; that nailed it all right. Those blood moons are a clear sign that something important is about to happen. But wait. Jewish custom calls for feast days fall in the middle of every month, at about the natural time full moons are appearing. The old Hebrew calendar always began with the first appearance of the new moon. And since lunar eclipses can only happen on a full moon, it is not odd that the red moons happen during Jewish feast events. There were 37 lunar eclipses on Passover and Sukkot during the 20th Century. And if you study the verses in Revelation you will find that other stuff is supposed to happen. The sun is supposed to turn “black as sackcloth of hair” and the stars of heaven are supposed to fall to the earth. Also all of this heavenly show is supposed to herald the blowing of the Seven Trumpets. We haven’t seen the black sun, the falling of the stars, or the sounding of all those trumpets yet. While people the world over are acting a bit strange these days, there is a growing threat of another world war and the world is so overpopulated and polluted we believe a different kind of “end-time” is eminent, we don’t believe Jesus is dropping down from the sky. At least not anytime soon. Thus we think Pastors Hagee and Blitz are wrong in their predictions. We do not suggest selling your property and camping out on the nearby hill just yet. Jesus warned about all of this predicting. He said: "No one knows about that day or hour, not even the angels in heaven, nor the Son, but only the Father." Notice that what he said was that he didn't know when he was coming back either.